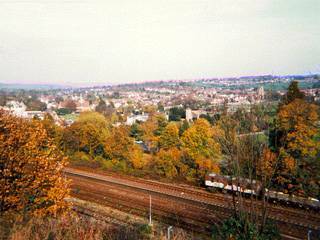 Highcroft Villas (of Dyke Road Drive) runs along the top of a railway cutting offering good views of Preston Park and Preston Village. This view is from the Villas looking north across the allotments above the London to Brighton line. The imposing semi-detatched, red brick houses which line the street were built in the 1880s for upper middle class residents. An 1885 street directory lists a reverend gentleman and military officers amongst inhabitants. At the top of Highcroft Villas are Lambourne’s Old Mill Works which were named after the former Preston Windmill that stood on the site. This was originally erected at Belle View (where Regency Square is now), but – following complaints from residents – it was towed over land by 36 oxen on 28 March 1797 to stand on its new site until it was demolished in 1881. First I’ve ever heard of a windmill being in this road! When they took the windmill away, was it reconstructed elsewhere? Are you sure it was on Highcroft Villas? If so, where? Also do you have any information about the road we live on, Inwood Crescent? My father Frederick Giles was born at number 11 Inwood Crescent on January 28th 1917. I went there once to see where he was born. Nice place. Never could find out anything about him though he did go to the local Grammar School. Even in those years the place was quite up market. I now live in a development named, Old Mill Mews which is on the site where I remember Lambourne & Ridley Enginerring works being. This is directly behind the Dyke Tavern Pub. I was wondering if this was the site of a windmill as I’ve been unable to find any pictures or plans to suggest that a windmill was on this site. My first job after leaving school was at Lambourne and Ridley’s, 1963-64. I remember the names Gerry, Barry, Jack and Dennis Martin, Lionel Standen, Bob Stevens, both Franks, Charlie Bashford, Len Swain, Ken, others too but memory faded. I lived in 42 Highcroft Villas for 20 yrs until 2002. My researches in the local reference library indicated that the windmill was on the site of the new buildings built since 2002. It had previously been owned by the brewery that also owned the Dyke Tavern. The windmill was dismantled and rebuilt on Clayton Hill, it being either Jack or Jill, can’t recall exactly. Also of local interest is the old Lambourne & Ridley building, it was the only production car builder in Brighton unless its demise between the wars. There are maps in the library showing the site of the windmill. Hope this helps. That’s great information. If anyone has any (especially old) photos of Lambourne & Ridley’s, or the brewery I’d love to see them. Old Mill cars (steam) were built here early 1900s from 1890s’sh. Mr Lambourne (Albert I believe) made these prior to going into general engine reboring etc. I started there in 1958 (my second job). I was first working for (BMW) Isetta of Gt. Britain, in the old loco sheds at Brighton Station. The jib for lifting the sacks of grain for milling was still there and being used to lift engines in and out of the fitting shop on the top floor. There was some of the original stone and brick flooring from when it was a mill on the ground floor, some of it had been covered by the erection of a bomb shelter, we used to store coke in here to warm the works in winter. I hadn’t heard of a brewery connection before until reading of it on this site. I recall however the Dyke Road Hotel had a glass window pane with Beards Brewery etched on it (taken over by Harveys of Lewes I recall). I lived in Highcroft Villas for 17 years! We had a maisonette for £15 a month!!! Fabulous views to Preston Park and we loved to sit and watch the cafe in the park at night changing to all the rainbow colours little by little. Life was so nice then. People liked each other and had time for one another. Now it’s all rush rush rush and lots of violence. How I love those good old days before all that.